StayFocusd is the focus police. The extension monitors your time spent on distracting websites (Facebook, YouTube, etc.). Once your time quota has been reached, distracting websites will be blocked. – Define distracting websites: I added GMail, IMDb, amongst other. – Change your quota for distraction: default is 30 minutes; it’s a good one but you can change it. – Define monitoring hours. Example: you want to be restricted only between 9am-5pm and be free outside of those hours. – Define monitoring days. Example: you don’t want to be restricted on weekends. You can easily bypass the restrictions: simply go incognito or uninstall the extension. The extension is simply a deterrent, you still have to be disciplined. The idea is to be aware of how you spend your time. Numbers don’t lie (except a flipped over 6). – I check email, Facebook, LinkedIn, etc. only twice a day, at specific times. I am still able to reply within 8h. – I draft emails outside of GMail. I write them in Evernote (or Notepad, Textpad, Word, whatever). When email checking time comes along, I send all those email drafts in one go. timeStats is the focus accountant. Just like StayFocusd, it tracks your browsing. It can even block sites just like StayFocusd. However, it’s in its reporting capabilities that timeStats shines. 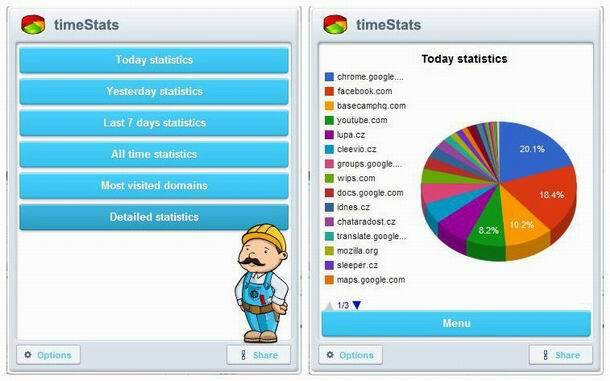 It can give you detailed statistics as well as summaries of your browsing activity. I review my statistics every week to see how I have spent the week. Again, numbers don’t lie. Opportunities to get distracted online are everywhere. Your laptop, your phone, your tablet and soon your watch and Google Glasses. I have 40+ apps on my phone and about half send me notifications on a regular basis. In my previous corporate jobs, I’d receive 70 emails per day on average. I have turned off almost all app notifications (including email). Below are steps for the “nuclear option”: turn off all notifications for a given app. If the app is non critical, let it notify you when you open it. Go to Settings > Notifications Center. Under “Include”, touch a given App. Set “Badge App Icon”, “Sounds”, etc. options to disabled. For more information on the notification center, read this. Go to Settings > Mail, Contacts, Calendars > Fetch New Data. Repeat and rinse for all your email clients. As an engineer and an executor of work, it’s easy to get very deep without taking a deep breath. When I am in the zone, I can work for hours without stopping. It’s like digging a hole with a spoon for hours with your head down. The problem is that you can’t see the shovel that was dropped next to you. You have stopped questioning why you use a spoon in the first place. As soon as I am about to do some intense work, I turn onTomatoes. Tomatoes is a web based Pomodoro Timer. The basic idea is to do work in phases: 25 minutes of work, followed by a 5 minute break. The break gives me a chance to take a step back and question what I am doing. During those breaks, I have had moments of great clarity that have steered me away from big time wastes. When I was a college student, I used to do my homework with the TV turned on, in the background. It was a distraction but I liked the background noise. Some studies have shown, that some mild background noise can help boost creativity. I don’t know how much to trust those studies, but I feel that background noise does give better focus. Right after my morning coffee, I go to Coffitivity for my daily dose of background noise. It’s free. Stimulating coffee shop sound from anywhere! Focus@will has some great work music. It’s free for 1 hour of continuous music; reloading the page resets the timer. Feedly is my personalized newspaper. It centralizes all my news feeds (blogs, magazines, articles) into one place. Unroll.me organizes all my non urgent emails into one big newsletter. While I like GMail’s categorization, Unroll.me slashes even more unwanted notifications. Mind mapping is great way to organize your thoughts. I use it everytime I am stuck on a problem (technical or otherwise) or unable to figure out the next step to solve it. My favorite mind mapping tool is mind42 (for its keyboard shortcuts). I have always wanted to try meditation, but I never knew where to start. Headspace has been my gentle introduction to meditation: 10 minutes for 10 days. You can repeat the first 10 lessons as much as you want for free. Thank you so much for these tips. They have been a great help to me.